There are 44 Assisted Living Facilities in the Arlington area, with 5 in Arlington and 39 nearby. The average cost of assisted living in Arlington is $4,760 per month. This is higher than the national median of $3,346. Cheaper nearby regions include Falls Church with an average starting cost of $4,499. To help you with your search, browse the 279 reviews below for assisted living facilities in Arlington. On average, consumers rate assisted living in Arlington 3.9 out of 5 stars. Better rated regions include Falls Church with an average rating of 4.4 out of 5 stars. Caring.com has helped thousands of families find high-quality senior care. To speak with one of our Family Advisors about assisted living options and costs in Arlington, call (855) 863-8283. Arlington, Virginia is an urban county located just five miles of Washington, D.C., and is home to the Pentagon and the Arlington National Cemetery. It is one of the most densely populated jurisdictions in the country, with 65-year-olds and above comprising about 9.8 percent of the total county population. Five assisted living facilities within the county and 58 in nearby areas serve the needs of this group. ALFs in Arlington and the rest of the state are regulated by the Virginia Department of Social Services. The Washington Metropolitan Area Transit Authority’s Metrobus and Metrorail services provide access to most areas of Arlington. The Arlington Transit also offers bus services for cross-county routes and connections to the Metrorail. Both the WMATA and ART offer fare discounts to seniors, and both services provide easily accessible ramps and wheelchair-friendly buses. Summer temperatures in Arlington can average as high as 88 degrees, which is above the comfort range of 70 to 80 degrees. This warm, humid condition may be unpleasant for seniors who enjoy outdoor trips and activities. The cost of living in Arlington is relatively high at 192, way above the U.S. average of 100 and Virginia’s 114. Healthcare, however, is 92, a little below the state’s 102, translating into slightly more affordable health services for seniors. The American Lung Association ranks the Washington-Baltimore-Arlington area 17th in terms of ozone pollution. Arlington is classified as unhealthy and very unhealthy in terms of ozone and particle pollution, respectively. This poses a serious health consideration for seniors with respiratory problems. Virginia, which includes Arlington, is a retirement-tax-friendly state, providing seniors with substantial savings. Social Security retirement benefits are not taxed, and up to $12,000 is deductible from pension income and retirement account withdrawals. The Arlington’s Office of Senior Adult Programs has an AC 55+ Travel Program that offers special bus trips to various activities and sites, including live theater and concerts, museums, sporting events, casinos, shops and restaurants. These are supervised by trained volunteers and provide social interaction among the county’s senior residents. Assisted Living costs in Arlington start around $4,760 per month on average, while the nationwide average cost of assisted living is $4,000 per month, according to the latest figures from Genworth’s Cost of Care Survey. It’s important to note that assisted living rates in Arlington and the surrounding suburbs can vary widely based on factors such as location, the level of care needed, apartment size and the types of amenities offered at each community. 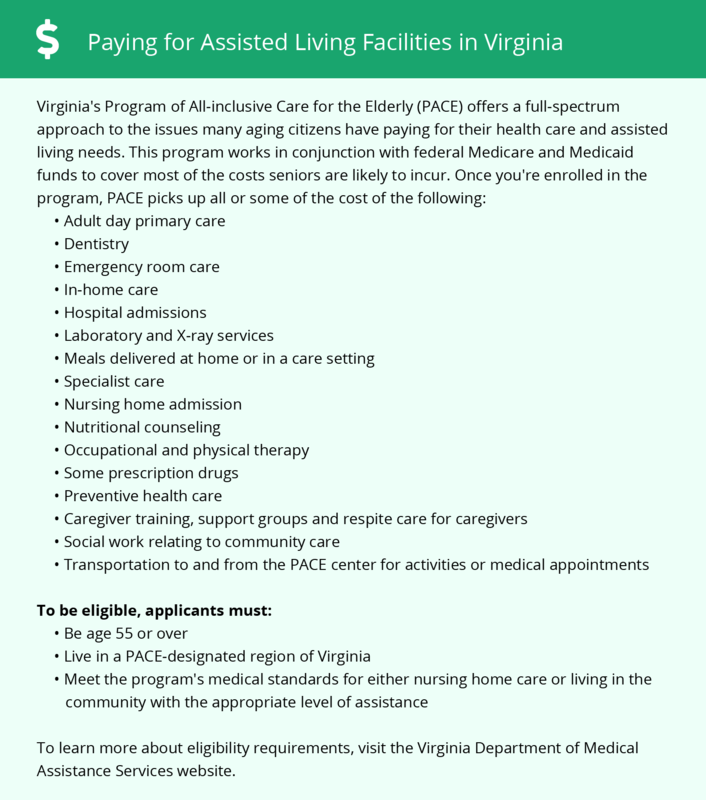 The Virginia Department of Social Services offers Auxiliary Grants to seniors in Arlington and the rest of the state. This is an income supplement for persons receiving the Supplemental Security Income and certain aged or disabled persons residing in licensed ALFs or approved adult foster care homes. The AG program is 80 percent state funded and 20 percent locally funded. To see a list of free assisted living resources in Arlington, please visit our Assisted Living in Virginia page. Arlington-area assisted living communities must adhere to the comprehensive set of state laws and regulations that all assisted living communities in Virginia are required to follow. Visit our Assisted Living in Virginia page for more information about these laws.